April 16--Spring Concert Series--St John's Lutheran Church, 7 p.m.
April 13--Spring Concert Series--LDS Church, Westchester, 7 p.m.
February 1--ESUMC 83rd Anniversary Dinner: Joseph and the Amazing Technicolor Dreamcoat--7:30 p.m.
January 31--LDS Church, Gardena: Joseph and the Amazing Technicolor Dreamcoat--7:30 p.m.
December 15--An Old Town Christmas--Old Town Music Hall, 7:30 p.m.
October 20--Joseph and the Amazing Technicolor Dreamcoat--Riviera United Methodist Church, 7 p.m.
June 20--From Brahms to the Beatles--Old Town Music Hall (Benefit for El Segundo Downtown Heritage Mall), 7:30 p.m.
September 21--National Anthem at Dodger Stadium (picture)--5:30 p.m.
September 21--military banquet (US Horse Cavalry Assn) at Woodland Hills Marriott, 9:00 p.m. This is intended to be a list of all performances by the Hughes "Notables" Chorus since the name "Notables" was chosen, in 1984, until the group became independent of Hughes, and was renamed The Notables, on July 1, 1997. For a history of performances since, see this page. 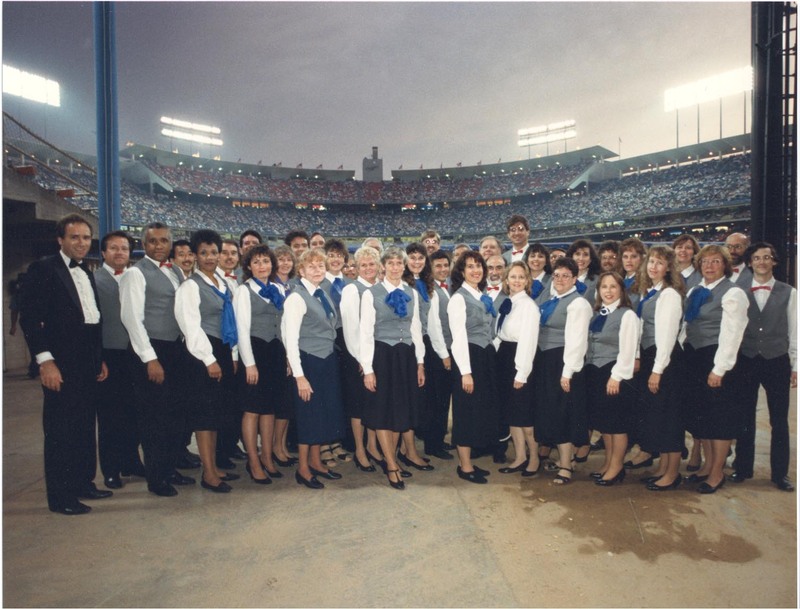 For prior history, when the group was known simply as the Hughes Choir, see this page. This list is probably not complete. The "Notables" Chorus regularly performed three concerts (usually Tuesday, Wednesday, and Thursday) in the R1 auditorium four times a year, in March, June, September, and December. In addition, the group performed at the El Segundo Joslyn Center twice a year, in June and December, usually on a Tuesday evening, and once a year at St John's Lutheran Church, on a Wednesday evening in December, as part of their series of Advent Services. Last updated: May 31, 2007 by Webmaster. If anyone has any information on completing or correcting this list, please email Webmaster.